Deck out your Twitch channel with a brilliant profile banner made with Canva. Start by choosing from a huge variety of layouts, images, photos and design elements to create just what you need. All Canva layouts are fully customizable so you control everything from featured images and illustrations to colors, fonts and textures. You can even collaborate with friends and get their help with designing your banner. Create a new Canva account to get started with your own Twitch Banner design. Want to customize your banner and really make it your own? Once you’ve decided on a template you can upload your own imagery, tweak dimensions and change as many or as little details as you like. Add your Twitch username and even maximise your following and reach on other social networks by adding social buttons and accompanying usernames for your YouTube, Instagram and Twitter accounts. Feel inspired? Get designing! Great design is all in the details, and luckily we’ve got your back. Our designers have done the hard yards and have lended their skill to create hundreds of text elements that seamlessly pair fonts for maximum visual impact. You can simply drag and drop these elements onto your designs to create something amazing. Feeling adventurous? Click on the ‘text’ tool to add titles, subtitles or whatever you need. You can even check out Canva’s design school blog or our font combinations page for guidance and inspiration. It really is that simple. Once you’ve gained a crowd of fans, why not share your genius and give back to the community? 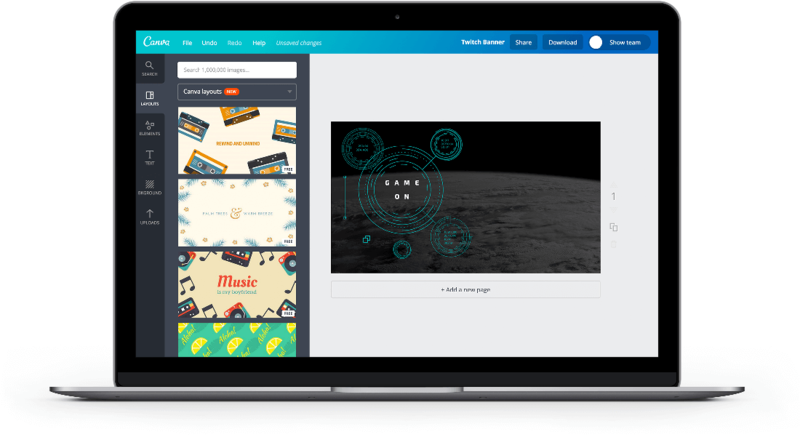 Canva allows you to easily share your creations on Facebook, Twitter or anywhere else. Are you on Reddit? You can simply post a link of your design for anyone who might be looking for help or inspiration. Just open up your design, click the Share button to generate a link to an editable version of your design, and give anyone the ability to tweak your banner and make one of their own. Simply head on over to www.canva.com to start creating your Twitch banner design. You won’t need to download Canva, just create an account and log in. If you need to design on the go, you can always download our free iOS and Android apps from the App Store or Google Play. How much does it cost to create a design in Canva? Designing in Canva is free! Our library of Twitch banner layouts has been created by awesome designers, making it as simple as a few clicks for you to create a professional design. If you use your own images in your design, the entire process will be free.